The club held a British Canoeing Rio Starter event on 03 September. Paddlers did a short timed sprint from Bridge 1 back to the club. After a rest they completed a timed run on our mini slalom. The times of each part were added to come up with the results. 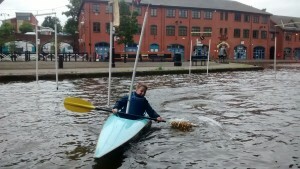 The slalom boat proved a hit. Two SUP’s did the slalom course!